These days, Grant Hill is one of the more prominent NBA faces on television. But over 20 years, the 43-year-old put together one of the most interesting basketball careers ever. One of the best college basketball players ever, coming out of Duke, Hill battled through a series of injuries early in his career to extend his pro career through the age of 40. This week, Hill took the time to chat with AOL Sports about his involvement with the Allstate NABC Good Works Team, as well as this year's NCAA basketball season and some NBA talk as well. Tell a little about your involvement in the Allstate NABC Good Works Team. It's very exciting to partner with Allstate and NABC for the 2016 Allstate NABC Good Works Team. This is my third year doing it -- the fourth year of the actual program. You really can honor and recognize athletes -- not just basketball -- from Division I, Division II, Division III, NAIA schools, for their work, and understanding the importance that basketball may have, and using that to do some really meaningful things. I know for me, my first understanding of Good Works was in college. At Duke, I had the chance to volunteer with that community. It really helped touch me and how I'm trying to give back in a number of different ways. So to see these kids doing it on a whole other level -- on a grander scale -- it's pretty awesome to be associated. We get to meet the kids at the Final Four, take part in a community event with them, which will be one of the highlights, for me, of the basketball season. This college basketball season has been one of the most intriguing in recent memory, partially because no team can seem to hang onto that No. 1 ranking. What's been your overall assessment of the parity at the top of the polls? The beauty of basketball in college -- because there's a revolving door -- every season has its own personality and storyline. Last year, I think what was very intriguing and exciting to follow was the undefeated season of Kentucky. "Could they run the table?" I thought that was one of the main storylines throughout the season. This year, there's not a clear-cut, dominant team. And I think what that ultimately will do -- if history repeats itself -- there will be some upsets in the tournament, as there are every year. But there may be a mid-major sneaking into the Final Four -- and maybe even winning. So I think the parity is good for the game. It's not the first time in recent years that this has happened. But what you saw last year -- an undefeated team, three legendary coaches, Hall of Famers, who have been in the Final Four before -- you may not see that this year. That's what makes it exciting. It's the best three weeks of basketball, waiting and seeing how it unfolds. The upsets, the buzzer-beaters -- you don't know when it's gonna happen, but you know it's gonna happen. It's just a matter of how much it happens throughout the tournament. We have to talk a little about this Duke team -- that three-game losing streak last month bumped them from the top 25 for the first time in years. They've strung together some encouraging performances lately -- what are your thoughts on this season for Duke so far? I think every team has to find themselves. It's tough when you are defending champions, and you have all new starters out there on the court. So this team has to find its way. And you can forget last year, there was a period where they lost to Notre Dame and they struggled. They found their footing a little bit and got going -- then had a magnificent run. I thought last week, this team was dealing with some adversity, and you weren't sure if they were gonna be able to turn it around -- Coach K got sick. But it seems as though this team has really come together in a moment of crisis, and maybe turned the corner. It's still early. But they have to find their own way. They have to travel their own journey. So I know, for them, it's very comforting to know that you have a coach and a leader in Coach K who understands the personality and dynamic of every team. And he's gotta provide for them whatever that particular team needs. And this year is entirely different than last year. It's part of the journey, part of what's made him a Hall of Famer. They'll figure it out. An interesting topic came up on ESPN last week, where analysts were asked to name their all-time Duke starting fives. What's yours? We've had some really good ones through the years. You'd have to go with Christian Laettner. 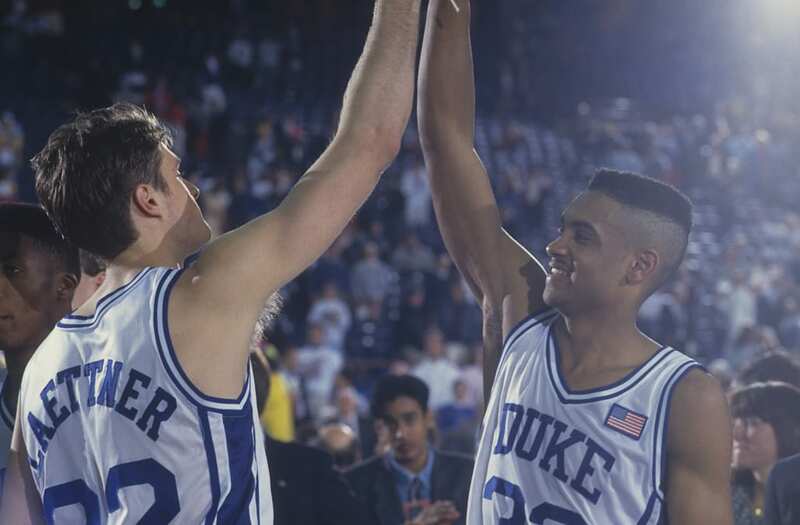 In terms of what he accomplished in college, I think he was the most dominant Duke player, and maybe the most dominant college player over the last 35 years. It's pretty remarkable. I got a chance to see two of those years. Johnny Dawkins was a great player. It's hard to say. I thought Jay Williams had a tremendous run. I think it speaks volumes for the program, what we've been able to do over a long period of time -- it's hard. Where does Shane Battier sit? Bobby Hurley? J.J Redick was one of the great scorers in history and a great Dukie. Elton Brand -- though he was only there for two years. Talent-wise, Kyrie Irving. It's pretty amazing, as you really start looking at the players to come through and are part of that brotherhood. We've got some talented guys who've had amazing careers while at Duke. I know I didn't really answer the question -- I really don't know. I'm gonna leave somebody off who's probably very deserving. You could take about 12 guys and I'd think they're all worthy of being in the top five. Since retiring, you've been very visible on TNT and NBA TV, and hosting Inside Stuff. Was television and broadcasting always something you saw in your future? No. Actually it wasn't. I had dabbled with it. I did the NBA Finals in 2007 -- Cleveland versus San Antonio, I was on the desk for ABC and ESPN with Dan Patrick and Michael WIlbon and those guys. I kind of knew that I could do it. I didn't know if I was going to pursue it. With March Madness and NBA on TNT and calling games, I'm doing a lot of different things on a lot of different platforms and enjoying it. I'm having fun, I'm staying around the game, getting a chance to just enjoy the relationship with the league and the game in different roles. I've played, I've been a fan when I was young and dreamed of it. Now I'm the older guy who's played, done it all, and is here to offer perspective, explain and share my insight with the world. So it's a lot of fun. How much of your late-carer health was due to the time you spent with the Phoenix Suns' medical staff? I can't speak on them now. I think other teams have adopted a little bit of their approach. 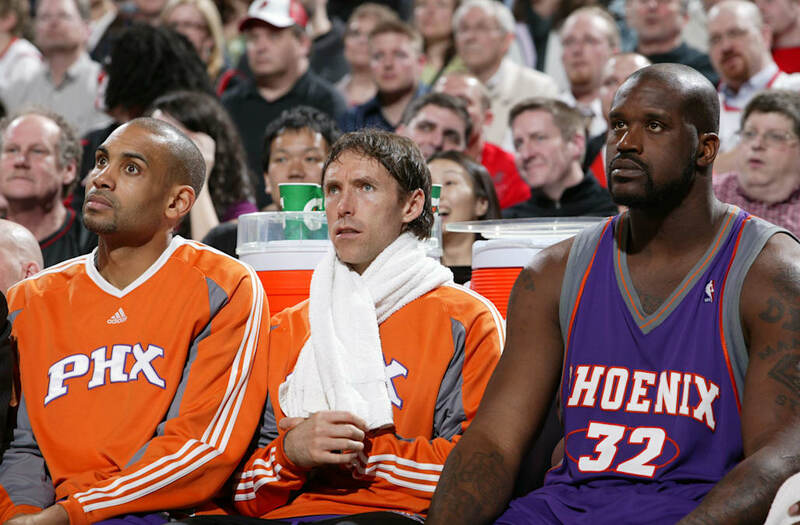 They had an interesting model, and they had three guys who were older players and had come there with various health issues, and were able to stay healthy and play in a majority, if not all of the games, and still play at a pretty high level -- Shaquille O'Neal, Steve Nash and myself. So I think that really helped contribute to their notoriety. Obviously with the work that they did, I learned a lot. Personally, through my whole journey with being hurt, I learned a lot about nutrition, dieting and recovery. Then I learned from their approach, which is really looking at the body from a global perspective as opposed to a regional perspective, if that makes sense. It was great. I enjoyed it. I had an enjoyable experience through the end of my career, and was still able to play at a pretty high level into my 40s. Around New York, Knicks fans tend to remember you as the player who was rumored to sign there every summer, but never did. Were you ever close to joining the Knicks, or was that merely a negotiating tactic? It's funny. Now, in my travels, I'm in New York a lot. I see Knicks fans, and people inevitably will mention that. I only seriously considered the Knicks twice -- in 2000 and in 2009. The other times, I don't know where all that chatter came from. I know in 2000, when I left Detroit, it was very intriguing. I met with Dave Checketts and Jeff Van Gundy -- I was seriously looking at it. They were trying to unload Patrick Ewing for me, and I wanted to play with Ewing, Allan Houston, Latrell Sprewell and those guys. So for a number of reasons it didn't make sense. Then in 2009, when Mike D'Antoni was there -- before Amar'e Stoudemire came. I went up there and made a visit -- the only time I actually visited -- and did a tour. The team wasn't good, but I believed in D'Antoni and Donnie Walsh, so I was seriously considering it. And I liked New York. I always had this sort of fantasy about playing in the city, living in the city -- enjoying it, but also the challenge of being a player in New York City. Obviously I was never able to do that. But those are really the only two times that I can think of. I think I might have mentioned it other times, but I don't think there was ever any other serious negotiations or discussions. But I get that all the time from Knicks fans, which is pretty amusing.